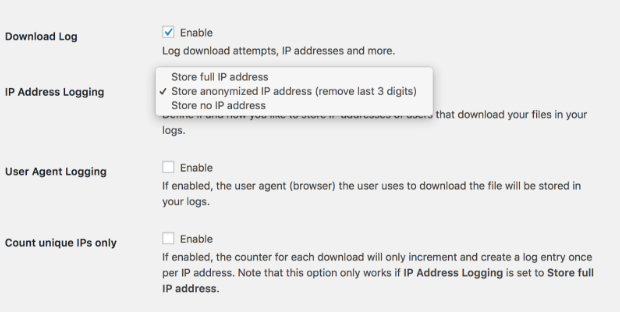 Download Monitor allows saving logs that contain the IP address and other user details whenever someone downloads on your website. In the 4.1 update of Download Monitor, we have added more controls for you to choose exactly what data you wish to collect from the user while still keeping a log of all downloads. Email Address & Username if they were logged into your website. Only store anonymized IP address by remove last 3 digits. With these new options, you have more control over what user data you like to store when a user downloads your files. These options will help you in making your website GDPR compliant. Please note that controlling what user data is saved is only one part of making your website GDPR compliant. Please note that this article is not legal advise.